The state constitutional deadline for legislative redistricting is December 31, 2001. There is no congressional deadline. The legislature is responsible for both congressional and legislative redistricting. The house and senate Governmental Affairs committees have jurisdiction. The state Supreme Court will step in if necessary. The governor has veto power over both the congressional and the state legislative plans. Previously a preliminary plan was considered at statewide public hearings. This time, legislators intend to take the unmodified plan, overlaid with the updated census data on a regional road show. The strategy is to show the malapportioned plan and take comments and suggestions on how to modify it. These "road shows" will be broadcast on the Internet. Justice Department submissions under Section 5 are available at the state library. The anticipated focus of conflict will be on the severe regional population shifts that occurred since the last census. The decision on how to adjust for regional losses and gains will greatly affect many incumbents’ ability to retain office. Some incumbents may have to run in newly drawn districts against other incumbents. Congressional Republicans enjoy a 5-2 advantage over Democrats, although they represent three Louisiana districts that could be competitive. With a solidly Democratic state legislature, Democrats might try to put more Democratic voters into those districts, but such districting plans would likely face a veto by the Republican governor. In 1993, the 4th congressional district was challenged by some residents as an unconstitutional racial gerrymander in violation of the Equal Protection Clause. After a series of rulings by lower courts and the Supreme Court, the district eventually was ruled unconstitutional under Shaw principles. A revised plan enacted by the Louisiana legislature was also struck down in 1994. A federal court in 1995 drew the current congressional plan. It includes only one black majority district, and was upheld by the Supreme Court. 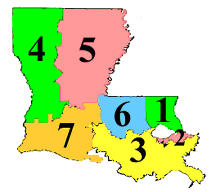 Louisiana’s second black-majority district, which had been represented by Democrat Cleo Fields, stretched across the ends of the state and was found to be unconstitutional. Fields did not run for re-election. The district court’s plan was denied preclearance by the Department of Justice, but remains in effect as an interim plan despite the Justice Department’s objection to the Louisiana' legislature's submission.